With its incredible beauty and high population of elk, Montana elk hunting is a popular choice for big game hunters. Wide open spaces and consistently applied conservation practices make this one of the best states for hunting elk. Hunters and outdoor enthusiasts come from miles around for their chance at bagging the five or six point bull that haunts their dreams. Both public and private hunting grounds have been known to yield excellent results during the fall hunting season. The seasoned hunter can return year after year to their favorite spot or one can opt for any one of the Montana guide services available. Montana’s plentiful natural resource of elk has provided the state with a boost to its economy through tourism for big game hunts. Montana elk hunting has gained a solid reputation for being a hunter’s paradise of unspoiled lands and vast landscapes. Many of the state’s conservation efforts not only meet the average satisfactory standards but exceed them, yielding high numbers in mature elk herd populations. This results in the increased chances for a highly successful hunt whether on private or public hunting grounds. While it’s anybody’s guess if one will actually bag their quarry, it is likely that nearly every hunter will at least catch a glimpse of this majestic animal in the wild. When it comes to elk hunting, hunters have a variety of options to choose from. Hunting on a horseback guided tour is a popular choice for many hunters. This type of excursion allows one to get deeper into the wilds of nature and come face to face with any number of possibilities. Others prefer the idea of a drop camp where a hunting party is flown out to a remote hunting location. Some guided tours provide tents, equipment and other amenities for hunters. Wall tents, showers and a high quality meal service can make for a comfortable and relaxing hunting experience. 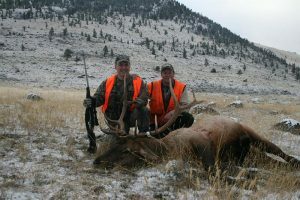 There are a good number of outfitters that can provide the best in Montana elk hunting. A reputable outfitter is one that prominently displays a current license for prospective clients. Guides who work for an outfitter should be personable and have experience with hunters of all skill levels. A competent guide will also have a firm grasp of not only hunting elk but the area the hunt will take place in. Most importantly, he or she should demonstrate good hunting ethics. A trip that is well planned and safe and secure from the beginning allows hunters to focus on the more important aspects of bagging their massive quarry.